There will still be some of these instruments extant and I thought it would be useful to give instructions for making them in working order, the original rubber having perished. 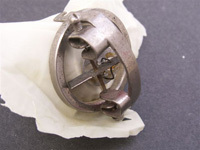 I learnt how to do this whilst a student at UCH in 1946 and I may be the only person alive who knows how to repair the arterial pick up Arthur Hollman, Archivist at BCS. 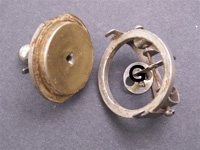 9 The recording device called a tambour is in two pieces. 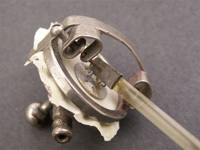 11 Movement of the membrane, via the air filled metal tube, causes the small metal plate (G) to move, and make the recording stylus to write.